An interesting plot, a unique twist, and an epic climax. What more could you want from a book? The Compound is about how Eli and his family ended up living in an underground compound after a nuclear war... and the sacrifices they were willing to make to stay alive. There's nothing better than a book that gets you thinking, and The Compound will have your mind on overload. The only thing I didn't like about this book was a slight unbalanced pace, but even so, it was truly amazing. The setting is very interesting, considering their living situation. I liked how the characters were pretty much basic, ordinary people who were shaped into a more exotic role by their situation. It made them more believable knowing the reason for some of their shocking choices. I would recommend this book to anyone who's ready to get their heart pumping fast and imagination expanded. Don't let this tiny, 125-page book fool you. This is no light reading. Don't You Dare Read This, Ms. Dunphery is about a teenage girl, Tish, whose life spirals out of control when her abusive father returns home after he left Tish, her brother, and unstable mother two years ago. This book was written through a journal Tish is keeping for her teacher, Ms. Dunphery's class. I really liked this book. It was intense and intriguing. I am also a big fan of Margaret Peterson Haddix, who is a great writer and did a wonderful job on this book. The setting was basic, nothing exciting. Some characters were a bit exotic but still seemed real. But I must say, if sad books are not for you, then don't you dare read this. This is the type of book to make you want to smile, cry, and scream at the same time. It stirs your emotions and keeps you flipping pages. Crazy is about a teenager, Jason, who decides to remain invisible until he meets 3 new friends who seem to understand him. But when his mentally ill father gets in trouble, Jason's life is turned upside down, forcing him to stop hiding and face the real world. The best thing about this book is that you feel so much while reading it—it's not just an emotionless story. The worst thing about this book was that everybody in it seemed to be the nicest person in the world, making the characters less believable and a bit annoying, in my opinion. The settings were interesting as well as the overall plot. 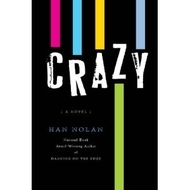 I would recommend this book to someone who's searching for something pretty "crazy" to read. Forget Vampires -- Immortals are the new thing! In Evermore, after Ever's entire family dies, she possesses the power to know everything about everyone by a single touch. But when a new guy, Damian, enters her life, she finally feels normal and at peace...until she finds out what Damian actually is. This book is definitely building off of Twilight, and non-Twilight fans like myself may think this book sounds like another horrible wanna-be. But even though it has obvious similarities to Twilight, it is so much different, and in my opinion, much better. Evermore is intense and interesting. The settings are interesting, but not nearly as much as the characters, each of them unique and different. Some great things about this book was that it was action-packed and kept me reading. I would suggest this book to Twilight fans, but I hope the Twilight haters will give this book a shot. I did, and ended up loving it. How do you say "boring" in robot? How to Say Goodbye in Robot is about the new girl in school, Bea, who meets the social outcast, Jonah, and becomes very close friends as they go through a series of dramatic events. I didn't really like this book because it seemed like everything that happened was random. The pace of this book was very slow, and then all of a sudden, BAM a random major event would occur. Shockingly though, the last few pages was so interesting and unusual it made me stop and think wow. Still, I wouldn't read the whole book over again for the last few pages' amazement. Another thing I liked about this book was that Bea and Jonah loved each other, but not in a romantic way. Thank you for a boy/girl book that doesn't end with kisses. As for the setting, it was interesting considering they went to a variety of places such as a hospital, Ocean City, strange parties, and weird restaurants. The characters did and didn't seem real. As for Bea, I can clearly picture a girl like her, but I have a hard time imagining any actual person like Jonah. So if you're looking for an interesting, happy-go-lucky love story, you'll have a hard time speaking robot. I have found my new favorite book! Split is about a teenager, Jace, who arrives at his estranged brother's house after being kicked out by this abusive father. Warning: this book is very intense and impossible to put down. It's very sad but has some much needed comic relief as well. The best thing about this book was how from the minute I started reading, my hands were somehow glued to the pages. Right when you think you're going to stop reading, something happens that makes you need to continue. The worst thing about this book—honestly I can't come up with a bad thing about it. The phase of this book is not to fast or slow and is constant throughout the story. The setting wasn't all to interesting, but the characters where very unique and real. If you can take the drama, suspense, and emotion, then you have found your new obsession. Me, my friends, and my English class all instantly became roped in to this unique and interesting book. The Giver is about a boy, Jonas, who lives in a utopia that controls everyone and everything, until he learns about the real world from long ago and finds out just how "great" his "perfect world" is. We read this book for English class, and everyone loved it so much that we were actually sad when the bell rung for next period. The best thing about this book is its' unique quality. You will never find a book quite like The Giver. The setting, a " perfect " community, was interesting and very different. The characters were easy to imagine—whether they made you smile or made you scream. Overall, I think I can speak for my entire class when I say this book was epic.